The ultimate gift of indulgence, our rustic wooden crates are filled with hand-selected favorites from our collection of artisanal gifts. Each product is handmade by a local artist, so you can "shop small" and pamper big! 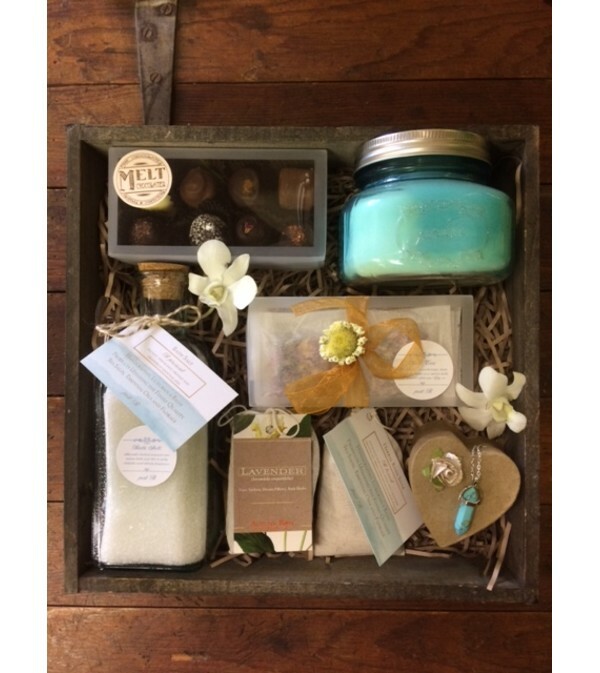 Each crate includes an assortment of hand-rolled chocolate truffles, a scented hand-poured soy candle, a "positive energy" necklace and gift box, a sachet of hand-blended potpourri, a box of herbal bath teas, an herbal bath soak made with himalayan & sea salts, essential oils and dried florals, and a bottle of our premium bath salts.